(TibetanReview.net, Feb04’16) – Ahead of anniversaries marking the Mar 10 uprising of 1959 and the Mar-Apr 2008 uprising protests, China is reported to have ordered out all non-Chinese foreigners from Tibet Autonomous Region by Feb 25. This is an annual exercise and China never announces it officially but only notifies travel agents and local authorities about its move. It is not surprising therefore that information about it comes from a posting on the website of the travel app TripAdvisor rather than any of China’s official news services. The region is expected to be reopened on Apr 1 if no major disturbance takes place during the closing down period. Western tourists have been the main source of information during past major protests in Tibet since Sep 1987. 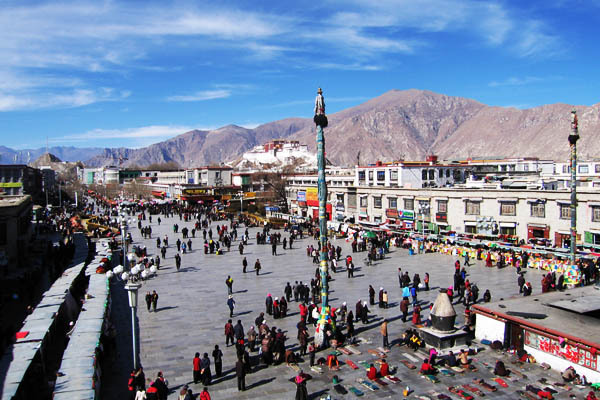 Even during normal times, non-Chinese foreign tourists have to obtain a special permit in addition to their China visa for visiting Tibet. In addition, China requires such tourists to travel in tour groups in order to be able to control them better. This also enables Beijing to prevent known journalists, human rights activists and other people disapproved or blacklisted by it from visiting the region.